AI trying to run through unwalkable area? & Proxies not working? I've just run into this problem of my AI trying to run off and edge (without any proxies) but of course not being able to, and therefore just standing still. Also on the navmesh proxy problem, whenever I've tried using them the AI always just tries using it even when I only have it set to one directional? I am using 4.7.5 but I've discovered these problems previously, however I never reported them as they had never actually impacted me. PS. The AI doesn't start on the higher level, it walks up the steps. AI trying to run off of an edge should not be happening so I'd love to get that project of yours to see what's wrong. 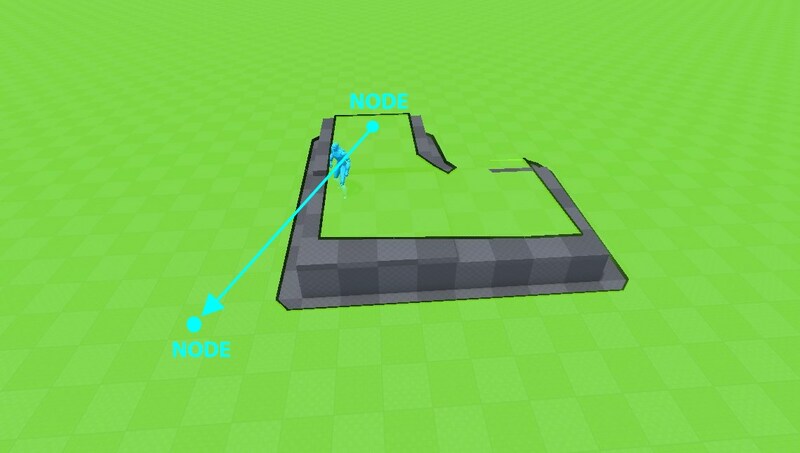 Maybe you're trying to use straight-line movement (without pathfinding)? You can use LogVisualizer to see what AI's path looked like. Regading NavLinkProxies they work as expected in 4.7, just make sure you're changing PointLinks' direction, not SmartLink's. I know, confusing, I'll take a note to change that. One thing that's broken here is that changing direction does not update navmesh. You need to give that actor a nudge to force navmesh rebuild (or just trigger a regular navigation build). Ahh yes, I had changed the smartlink not pointlink direction, however LogVisualizer is on and I am not seeing anything, am I missing something? I am using AIController 'MoveToObject' however if I use 'MoveToLocation' then the pawn just stops moving? Also the pawn sometimes navigates there properly, but always ends up not at some point, this is true even with working nav links. I'm trying to get a repro of this for Mieszko, but I am not having much luck. Are you willing to share the project where this occurs so that I can debug it personally, then get back to you with the results? If not, I can help debug further from here. Please let me know. Thanks! AI not moving on a moving surface. Sometimes.